Bell Seamless Gutters services Residents & Businesses throughout Somerset County, Morris County & Central New Jersey. If you have high-quality gutters installed on your home or business, then you might not think that you have to worry about your gutters potentially getting clogged. But the state of New Jersey is known for having harsh winds, heavy rains and powerful storms that can blow dirt, debris and leaves onto your roof – and into your gutters. That’s why you should add an extra layer of protection to your gutters by working with Bell Seamless Gutters. We offer gutter guard installation and service in Somerset and Morris counties and all throughout Central New Jersey that will keep your gutters clear at all times. Gutter guards protect your drain channels by covering them with protective covers. These covers are perforated to still allow rainwater to drain properly into your gutters, but offer protection that means that naturally accumulating leaves and sticks can’t get trapped in your drains. This also prevents animals like birds and squirrels from getting into your gutters, making nests or leaving dirt and other debris being. Our skilled professionals will come to your home or business, bringing the equipment necessary and the experience, resources and knowledge needed to install gutter guards the right way the first time. Having gutter guards installed on your gutters will prevent leaves, sticks and other debris from finding their way into your gutters. These items can collect inside of gutters that don’t have gutter guards on them and build up over time. This can cause clogs and can even damage your gutters if you aren’t careful. When you have gutter guard installation and service done at your New Jersey home or business, Bell Seamless Gutters will see to it that you receive gutters that will make your drainage system maintenance-free now and in the future. You won’t have to spend every weekend climbing up a ladder and clearing out your gutters when you have gutter guards. At Bell Seamless Gutters, we are more than happy to tackle any project that gets thrown at us. It doesn’t matter if you have a small single-story home, a large three-story business or something even bigger. 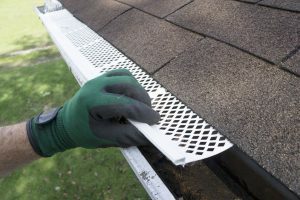 We know that our gutter guards could benefit you greatly, and we would love to provide you with gutter guard installation and service at your location in Morris County, Somerset County or anywhere else in Central New Jersey. Bell Seamless Gutters services residential and commercial clients and we’re standing by to help you. Call us at 800-597-1616 today to learn more about having gutter guards installed or serviced at your Central New Jersey home or business.